Practice makes perfect. After decades of peeling, bagging, and freezing tomatoes, I’ve got a bit of a system. Here it is, for your consideration. I recommend a four point system to stage, cut, toss, and collect. Since I’m right handed, I stage the washed tomatoes on my right, the cutting surface in front of me, the compost catcher (green bowl) in front of that, and the collection bowl on the left. Pick up the knife in your right hand (the cutting hand), pick up a tomato in your left hand, cut the top off or core it, toss the top/core into the compost catcher, and drop the tomato into the collection bowl. You can get quite a rhythm going and work through several pounds of tomatoes in short order. The tomatoes in the collection bowl are now ready for whatever comes next. In this case, we’re going to peel them. Note that the tops or cores go into the compost bowl, which of course goes outside into your gardener’s compost pile. I will fore go showing you a picture of my gardener’s compost pile. Maybe we’ll save that for another posting. Here’s how the peeling process looks. Notice that I have placed a cookie sheet under the cool water bowl on the left. Lower a few tomatoes into the boiling water. Leave them for about 30 seconds, then use a slotted spoon to move them into the cool water. 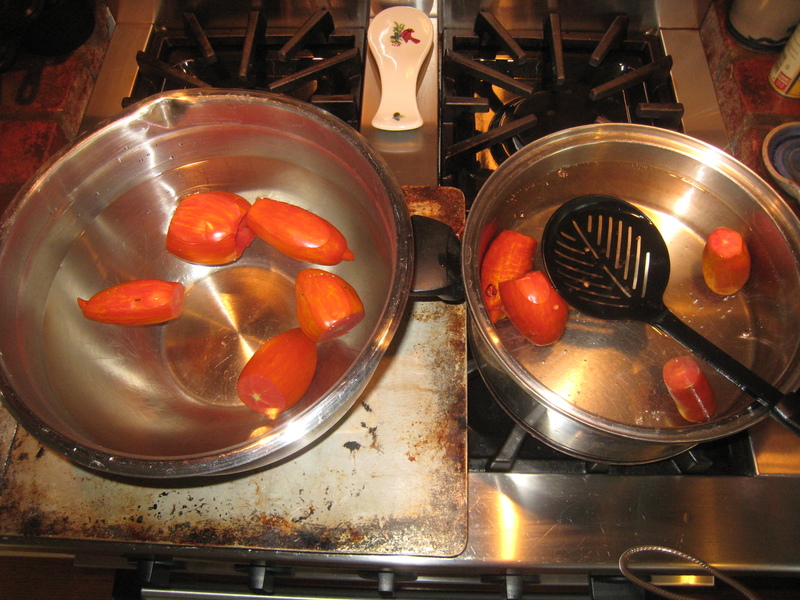 Put the next several tomatoes into the boiling water. You can peel the tomatoes in the cool water while you wait for the ones in the boiling water. 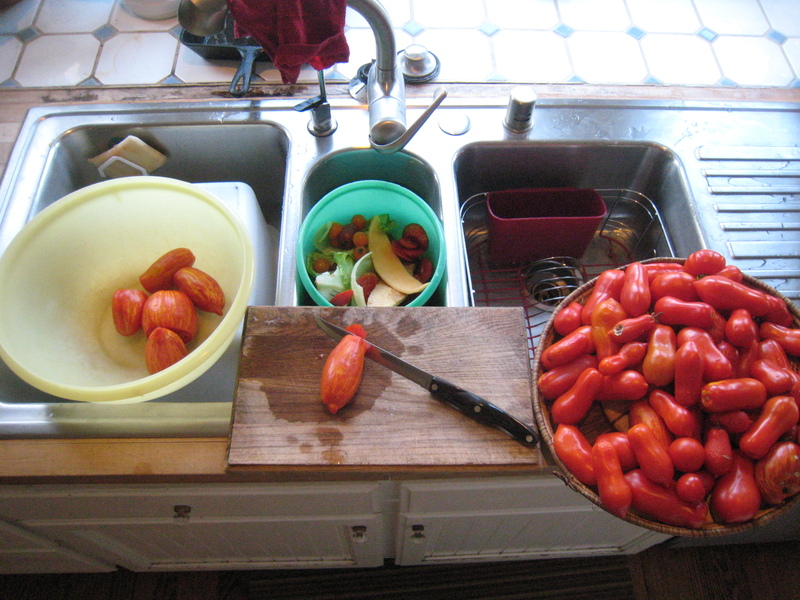 I leave the peels in the cool water and drop the peel tomatoes into another collection bowl. When you are finished you will have a bowl full of peelings and cool water. Pour this on the compost pile. You will also have a collection bowl of peeled tomatoes. These are now ready to freeze or otherwise use as needed.